...IN your needlework, that is! Recently we polled our Facebook friends to see which Kreinik thread they liked to use to replicate snow in their needlework. Hands-down Kreinik color 032 Pearl is the favorite, but some add a touch of blue to their snow with colors like Kreinik 194 Pale Blue, 9400 Baby Blue, 1432 Blue Ice, 094 Star Blue. How do you like to capture that cool crystalline coating in your needlework? Snow is sparkly in real life, and the easiest way to make it sparkly in projects is with metallic threads. 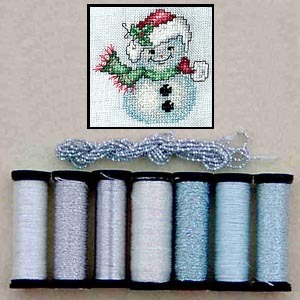 If you would like to try blending shades to create a snow scene, look for the Kreinik Metallic Gift Collection: Snowflake, available online at www.kreinikmall.com (in Kits & Collections), which has several different "snowy" shades in one boxed set. Want something really different and fun? We recommend Kreinik Ombre 3200 Pearl in the Satin Stitch for snow drifts. Here are some responses from our Facebook poll. Blending filament in pearl (sometimes with white thread) makes a sparkly snow .... and for that morning sun hitting the snow look blending filament in Starburst (over white or alone) mixed in with some plain white stitches seems to do the trick! - Loretta O. 032 - in all sizes - sometimes with #4 or #8 when I really want shading in the painting to show through - sometimes #12 when I want full coverage - and #16 when I am using 13 mesh. It is the "best" snow !!! - Betsy H.
Pearl Blending Filament (032) I love the twinkle it adds! - Maggie M.
032 blending filament looks most realistic. I'm looking forward to trying the new hologram threads. I think a scattered stitch of silver might be interesting. - Karen C.
I use 032 and 100 on needlepoint canvas. I use a lot of your 1/8 and 1/16 ribbon for projects too. I use 4005 what a great metallic thread. It amazes me how this color can change depending on what color is next to it in a design. - Diana M.
032 bf looks the best for getting the sun glittering on the snow look - Margaret S.
I like the 032 #4 braid. - Deborah K.
Love the sparkle of 032! - Diane S.
Have to agree, Pearl Blending Filament (032)! - Niina K.
That's funny cos I have to agree with the others, blending filament 032. Just adds enough sparkle without hiding the white I use underneath. So pretty for a subtle sparkle. - Mandy F.
My favourite for sparkly snowflakes on white fabric is 094 Blending Filament. But I'll use 032 on all colours. I love the shimmer and sparkle of Kreinik! - Doris D.
When I was a kid, I always colored snowflakes/snow with a light blue crayon (as white never showed up on white paper!). I still like to add a hint of blue in my stitching. :) 094 is pretty and I like the look when added to white floss. - Diane Z.
I use 032 Blending Filament when I'm doing a winter scene. I like the idea of trying 094 on white floss though, so maybe I'll try it on my next project. - Sharon T.
An 032 fan - have in #4, #8, 16 braid - must try the blending filament! - Melita G.
No need to shovel embroidered snow. Just stitch and enjoy the pretty effects of metallic thread sparkle on your project. What do you get for the guy who has everything? Gift cards? Too impersonal! How about a football jersey? He's already got 10 of 'em (yes, I have 10!). Does he tie his own flies for fly fishing? Wait a minute...now we are talking. Kreinik's Metallic and Silk Threads are perfect items for the fly tyer on your list. Yessiree, Kreinik threads are perfect for fly tying. There's just something about those metallic threads that fish just love. Maybe its because in nature, bugs, baitfish, etc have a metallic look. Ever take a close look at a Japanese beetle? Sometimes the metallic look just irritates the fish into biting. For not-so-shiny stuff, Kreinik silk threads and dubbing also do the trick. It might interest you to know that silk threads have been used in fly tying for centuries. It's as old school as it gets. We are also the only manufacturer in the world to make silk dubbing, the ultimate dry fly dubbing that is almost like tying a life preserver onto a fly. The material floats all by itself. Click here to learn more about our Silk Dubbing. Kreinik has a holiday specials page where you can find deals on some fly tying assortments they probably don't have. Click here to see these deals. Looking for a cool project to make for that guy who has everything? Try this laptop sleeve man-gift idea. It uses Kreinik Hi-Speed Machine Sewing Threads. Just imaging making this cool gift in your guy's favorite team colors and using team printed fabrics. Click here to visit PrudentBaby.com to see how to make it.